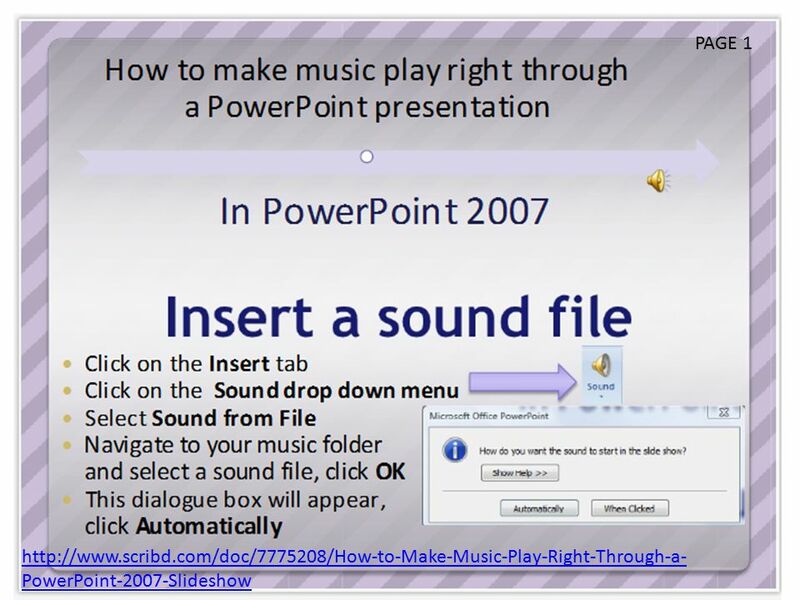 Embed sound in PowerPoint 2007 Posted by MeldunMeldun December 7, 2009 To embed sound into PowerPoint 2007, the sound file has to be in a “.WAV” format. 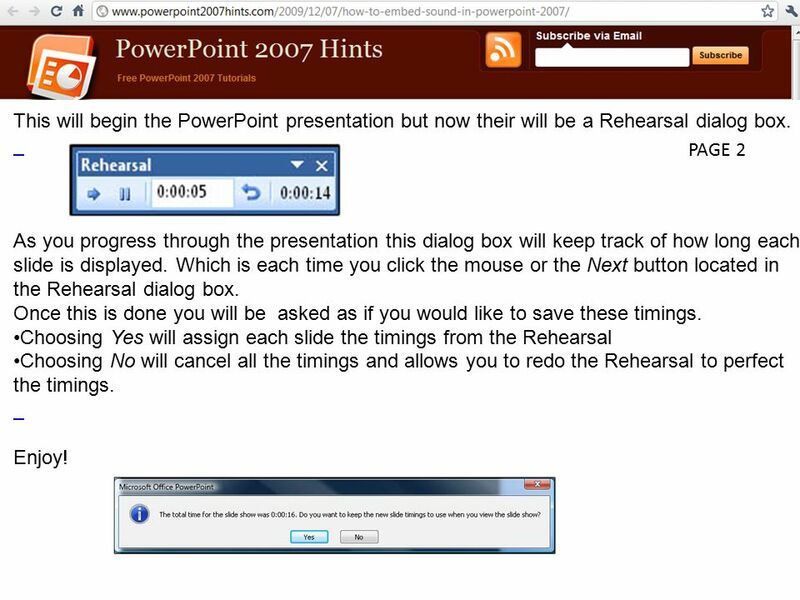 1 Embed sound in PowerPoint 2007 Posted by MeldunMeldun December 7, 2009 To embed sound into PowerPoint 2007, the sound file has to be in a “.WAV” format and not “.MP3”. If it is an mp3 file, the file will be linked rather than embedded. 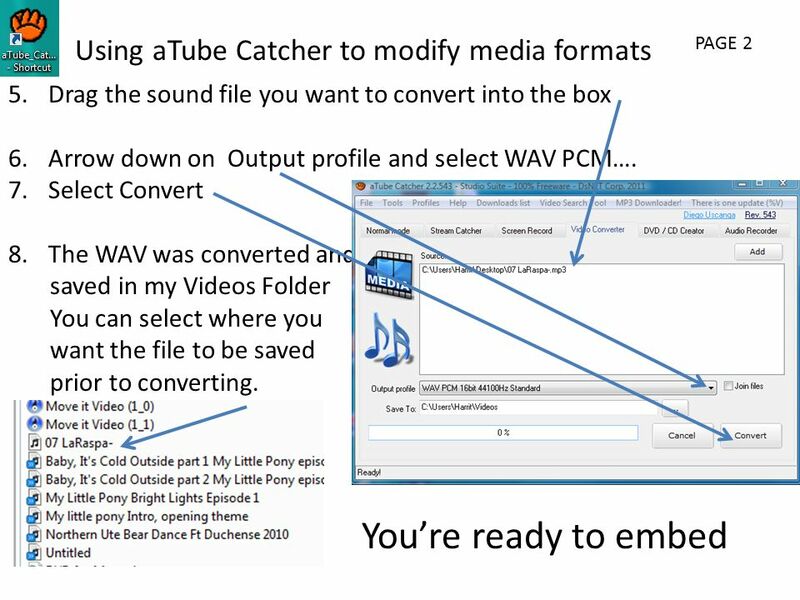 PowerPoint has no way to perform this conversion so to convert your.mp3 to a.wav file you will need a sound editing program. Important. Sounds that are already in the slides will need to be reinserted, or will not be considered embedded. Select the slide you would like the sound to be played on, or to start laying from, then follow these steps. 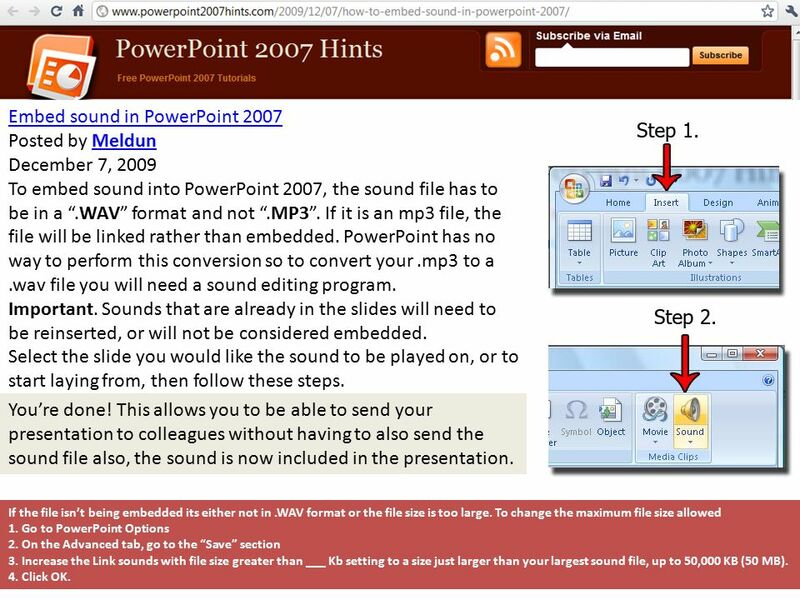 Embed sound in PowerPoint 2007 Posted by MeldunMeldun December 7, 2009 To embed sound into PowerPoint 2007, the sound file has to be in a “.WAV” format and not “.MP3”. If it is an mp3 file, the file will be linked rather than embedded. 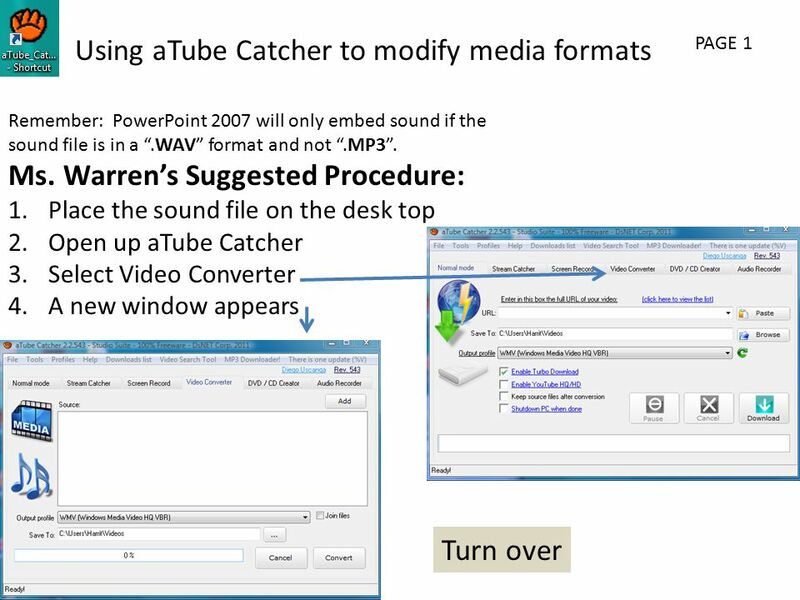 PowerPoint has no way to perform this conversion so to convert your.mp3 to a.wav file you will need a sound editing program. Important. Sounds that are already in the slides will need to be reinserted, or will not be considered embedded. Select the slide you would like the sound to be played on, or to start laying from, then follow these steps. You’re done! 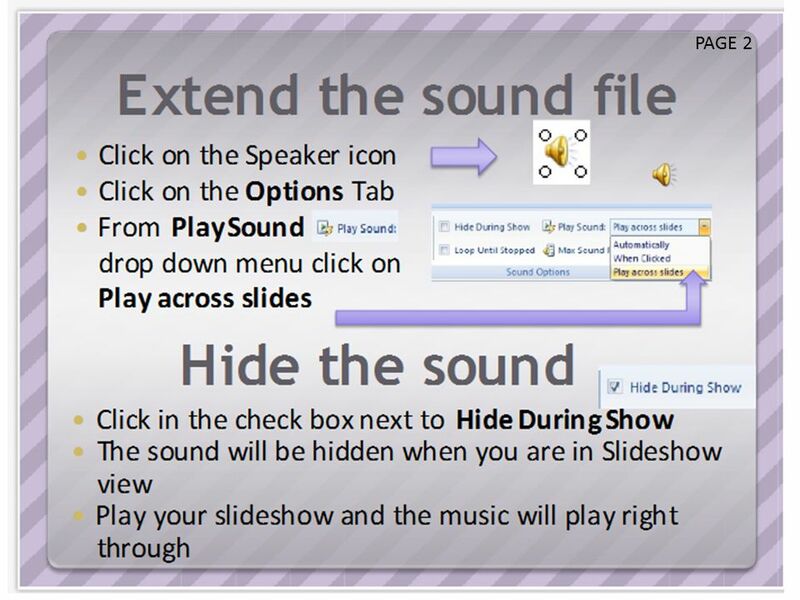 This allows you to be able to send your presentation to colleagues without having to also send the sound file also, the sound is now included in the presentation. If the file isn’t being embedded its either not in.WAV format or the file size is too large. To change the maximum file size allowed 1. Go to PowerPoint Options 2. On the Advanced tab, go to the “Save” section 3. Increase the Link sounds with file size greater than ___ Kb setting to a size just larger than your largest sound file, up to 50,000 KB (50 MB). 4. 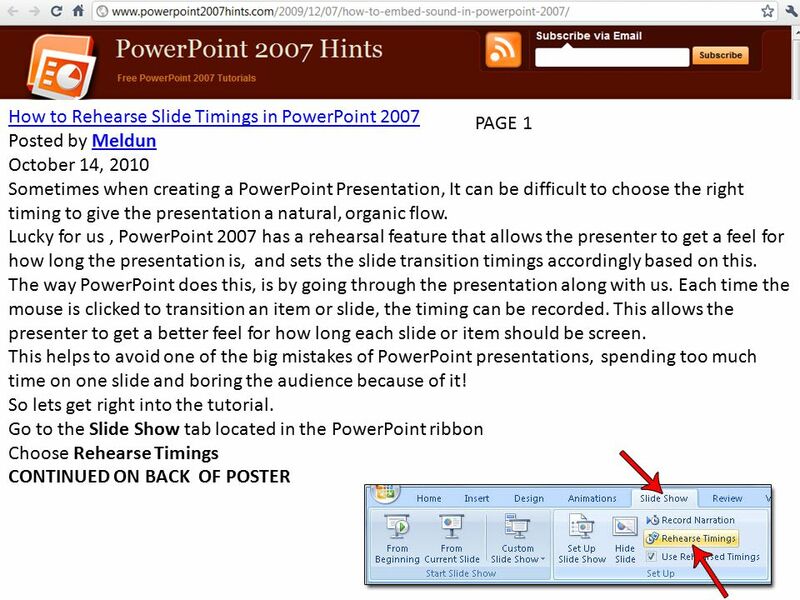 Click OK.
Download ppt "Embed sound in PowerPoint 2007 Posted by MeldunMeldun December 7, 2009 To embed sound into PowerPoint 2007, the sound file has to be in a “.WAV” format." 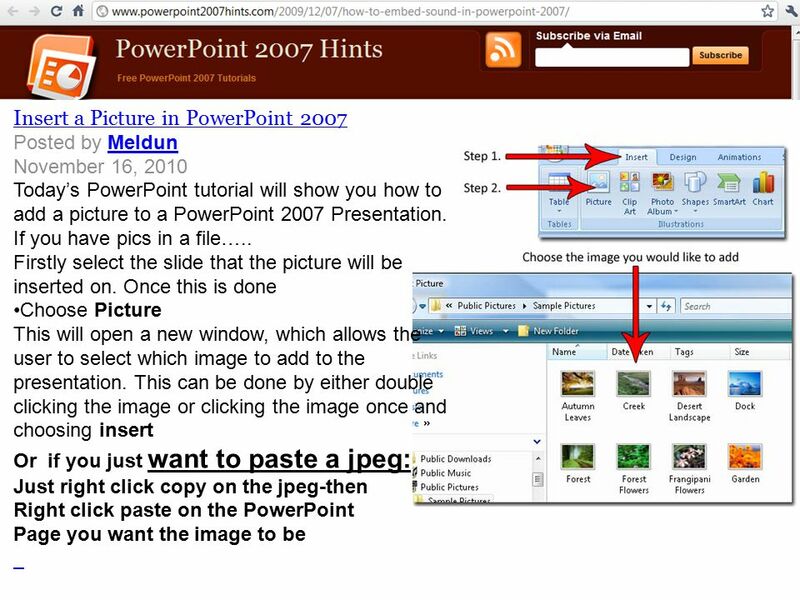 How can Microsoft PowerPoint 2007 help you share information? Training Room 4: Customization, Links, and Effects INF1070: Digital Presentation © UberGiant/shutterstock. 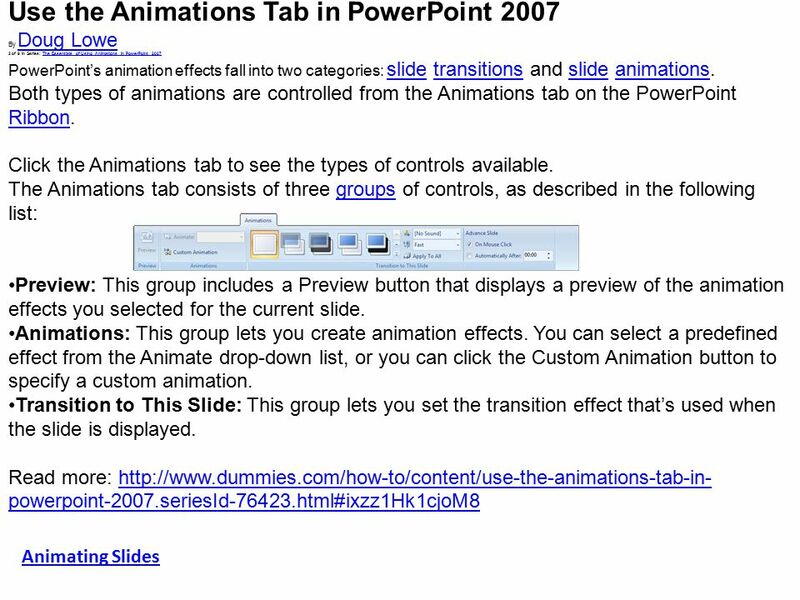 PowerPoint 2007 Dr. Karen Hallett Mark Millard Ji Young Chong Peter van Leusen. 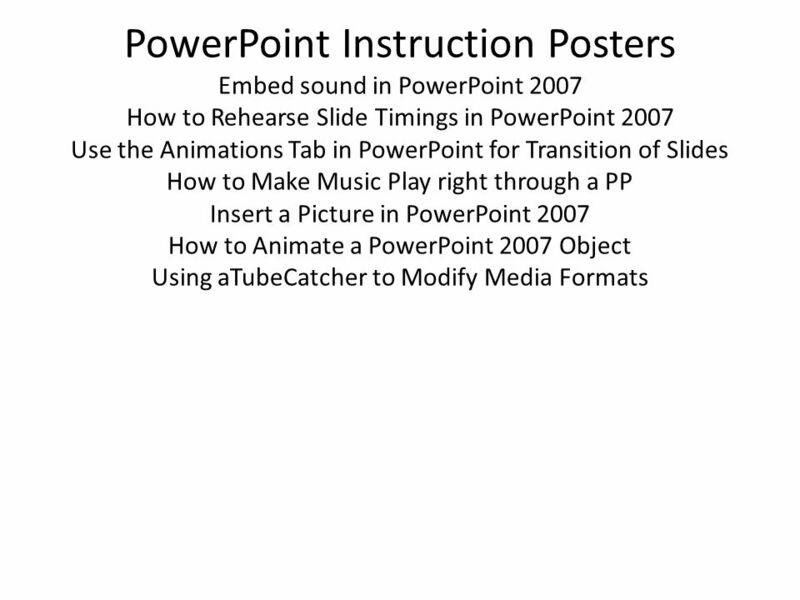 Additional Features in Microsoft PowerPoint Session Version 1.0 © 2011 Aptech Limited. 1 Advanced PowerPoint Cliff Solomon. 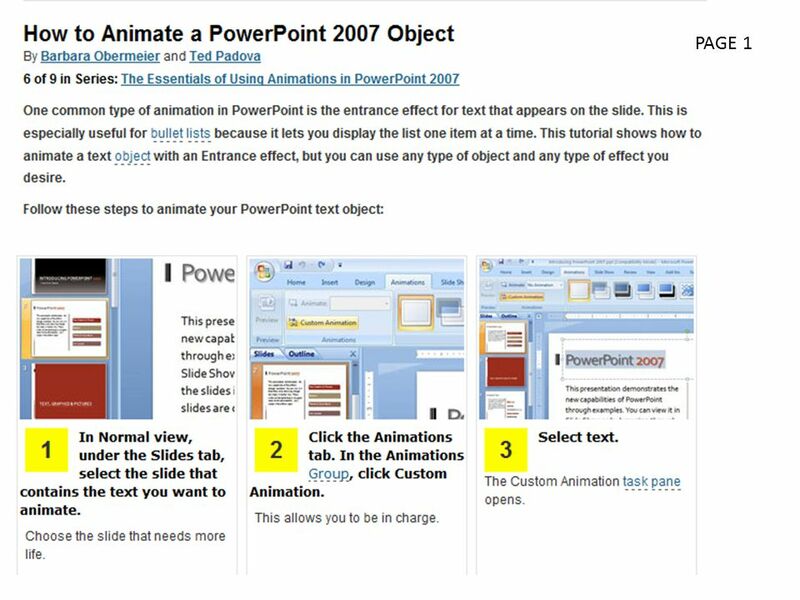 2 Presentation Outline Inserting Movies and Animations Into Your Presentations Using Progressive Disclosures and. 3.2 Presentation Software End Show Creating slide shows including audio,video and digital images End Show. COMPREHENSIVE PowerPoint Tutorial 3 Adding Special Effects to a Presentation. 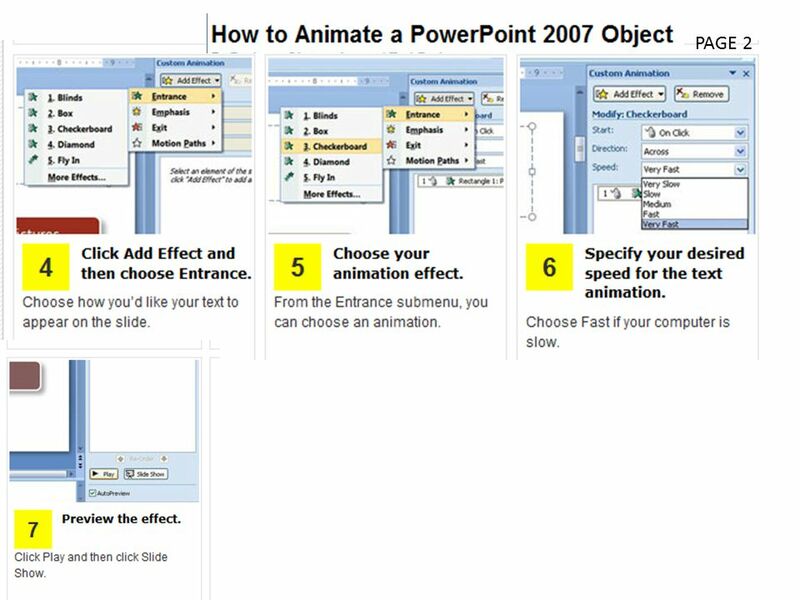 Creating a PowerPoint With Sound PowerPoint 2003 Version.  Experiment with the Design features to get the look you want for your presentation.  Most design templates will keep the design the same on all your. How to create a PowerPoint By: Abby Haehn. How to Start Go to your Launchpad, located in your dock Click on the P You should get a format screen Choose.